April is Child Abuse Prevention month. We are conducting this FUNDRAISER to support the Northwestern District Attorney’s Children’s Advocacy Center of Hampshire County. 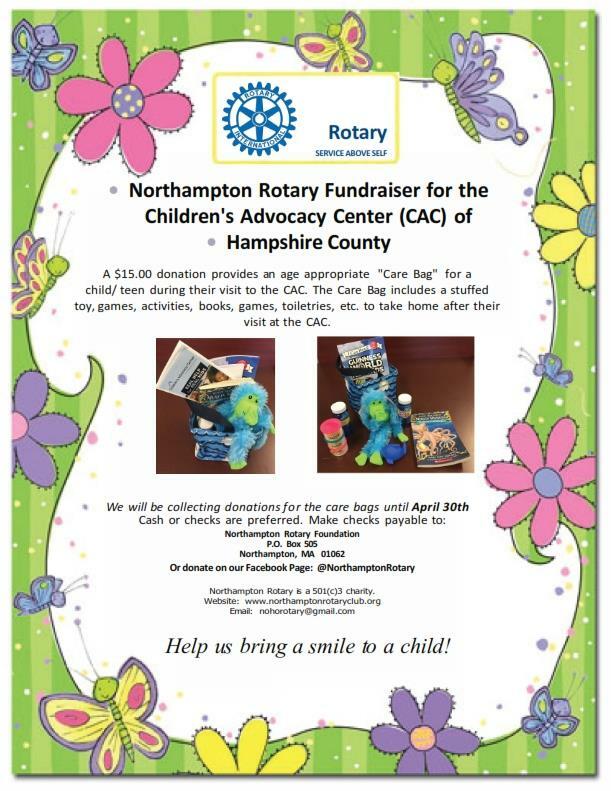 A $15 donation provides an age appropriate care bag for a child/teen during their visit to the CAC. The Care bag includes a stuffed toy, games, activities, books, games, toiletries etc. to take home after their visit at the CAC. Fundraiser runs April 1 to April 30. The Northampton Rotary Club is thrilled to present Grow Food Northampton with a $3000 check to expand programming for seniors and in our schools. These funds were raised at our 1st Annual Chowder & Wine Fest held in October at Glendale Ridge Vineyard. Annual Rotary Children's Holiday Party - Lots of fun at this year's annual Northampton/Easthampton Rotary Club's annual holiday party. Santa and Mrs Clause gave over gifts to over 80 kids! Shuffles the clown made balloon animals for the kids and sang in Santa. Rotary Foreign Exchange Student’s celebrating their first Thanksgiving in the United States! Thank you Plainfield Rotary Club of Connecticut for hosting all the students this weekend, including Northampton's Catalina Rojas from Chile. 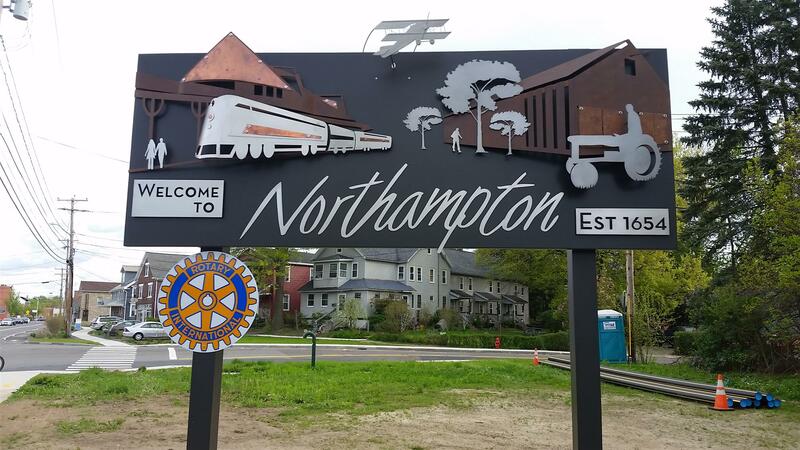 After 2 years in the making, Northampton Rotary is a proud sponsor of the second "Welcome to Northampton" sign on Pleasant Street. The Northampton Rotary Club serves the greater Northampton community,including especially its neediest children, by charitable deeds and contributions. 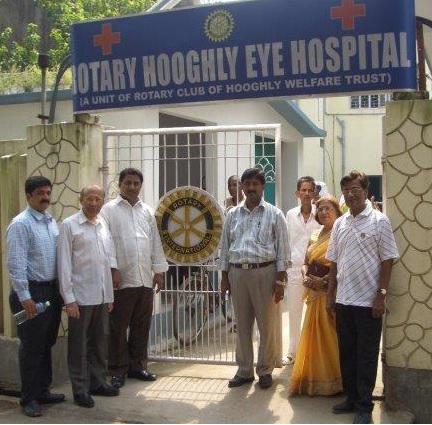 Our Club also advances the mission of Rotary International by fostering personal integrity, and contributing to world understanding and good will, through our like-minded fellowship of business, professional and community leaders.